In this chapter, you create a new application and provide validation in it from validation.xml file. DynaValidationForm class extends DynaActionForm and provides basic field validation based on an XML( validation.xml and validator- rules.xml) files. In which, the key passed into the validator is the action element's 'name' attribute from the in struts-config.xml which should match the form element's name attribute in the validation.xml. Validator-rules.xml file contained in struts-core.jar, and should be referenced in the struts-config.xml under the plug-in element for the ValidatorPlugIn. Important point is that NetBean IDE automatic configure the Validatior and Tiles and also plugin these resource into struts-config.xml file. Once you have configured the Validator Plug-In, so that it can load your Validator Resources you just have to extend org.apache.struts.validator.action.ValidatorForm instead of org.apache.struts.action.ActionForm. Then when the Validate method is called, the action's name attribute from the struts-config.xml is used to load the validations for the current form. So the form element's name attribute in the validator-rules.xml should match action element's name attribute. For each piece of the application, we show you the code and then explain the code. This application design in NetBeans IDE- 6.8 with Struts 1.3. At least one view component is required in every Application. A subclass of ActionForm is used to submit the date as application needed. A subclass of Action class which provide specific processing functionality for the application. A web.xml file is required for calling ActionServlet and struts-config.xml. 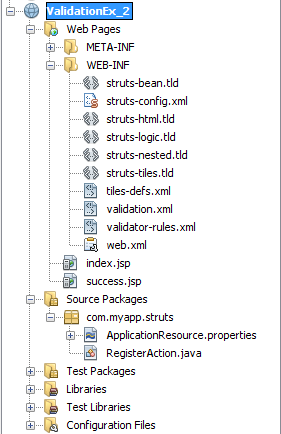 A struts-config.xml file is required for updating and mapping the update. Let's Start the application, this application provide a good understanding how struts framework works and also understanding the development of Struts applications. 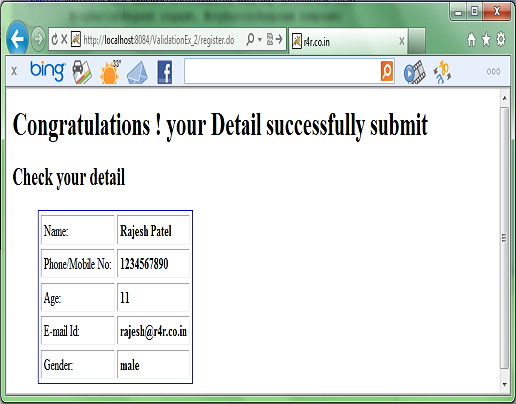 One DynaValidatorForm class name as a registerForm, used for store data as application need. One Action class name as registerAction.java, used for provide specific processing functionality. Two XML file name as web.xml and struts-config.xml file, used for provide control, mapping and validation in application. Step- 1 : Start your IDE ( NetBeans 6.8 with struts 1.3). Step- 2 : Open a new project( Crtl+Shift+N), name it , add server( Apache Tomcat 6.0.20 ), then add struts framework 1.3 , and don't forget to add Struts TLDs. When you click Finish button, your NetBeans IDE configure everything in place and project open in your IDE. Step- 3: Open index.jsp page, from your struts application and code it as describe below. Step- 4: Open success.jsp page, from your struts application and code it as describe below. Step- 5: Open web.xml file place in WEB-INF folder, this file is used to map the ActionServlet( work as backbone of application, every Action, Validation and ActionForm class control by this class) , struts-config.xml file, welcome file and five different TagLibrary. Step- 6: Open struts-config.xml file place in WEB-INF folder, this file is used to map Model class, Exception class, Validation class, Action class( Action class further choose View class) and ApplicationResource class. Step- 7: Open validation.xml file place into WEB-INF folder, this file used to provide the validation as well as error in JSP page of application, this( validation.xml) file call by struts-cofig.xml file as we define earlier. DTD Commons Validator Rules Configuration 1.1.3//EN"
Step- 8: Open validator-rules.xml file place into WEB-INF folder, file used to define the rule of validation set up by validation.xml file and error mapping into ApplicationResource.properties file. This( validator-rules.xml) file is also define for the custom error message. Step- 9: Now introduce Bean class into struts-config.xml file, Since In this application we used DynaValidationForm which extend DynaActionForm so, no need to make another Bean/Form class. Step- 8: Introduce Action class in to struts-config.xml file, as we define in our first application, that Netbean IDE able to configure your action class in struts-config.xml file. / * This is the action called from the Struts framework. Now your application is complete, so now start run your application. Start your server( which you embedded when configure our struts application), then right click your application and click upon Run option or open your welcome( index.jsp) page and press shift+F6.